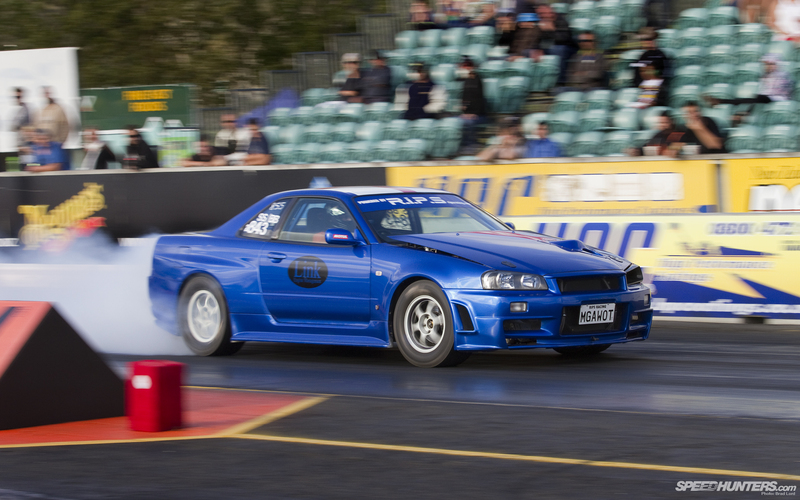 Getting a 3700lb (1675kg) Nissan Skyline GT-R down the strip in eight and a half seconds flat on its very first outing since an intensive, yet short lead build, is not any way, shape or form an easy proposition. 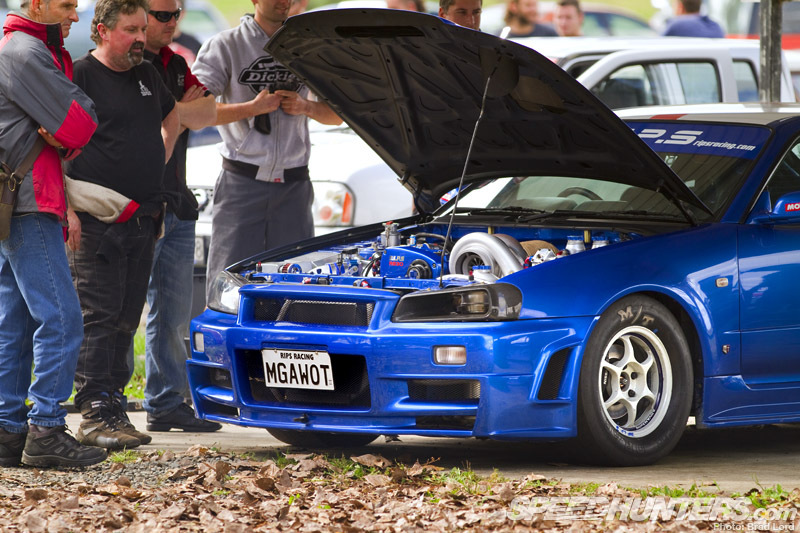 But behind the wheel of MGAWOT II, New Zealand-based but internationally-renowned Nissan RB-series engine builder Robbie Ward has just made it look effortless. 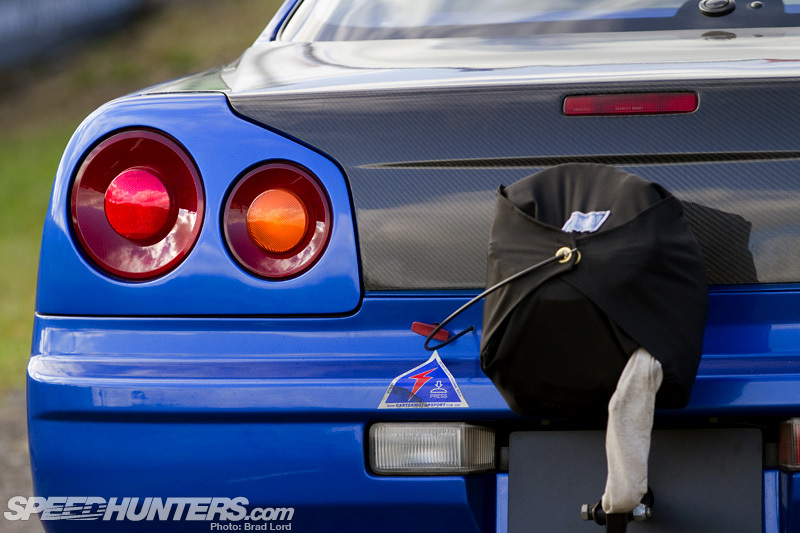 If you know anything about GT-R drag racing you’ll probably recognize Rob’s name. If not, you should recognize his company’s, because for the last decade that modest workshop in a small city at the center of New Zealand’s North Island has been turning out some of the quickest and fastest Nissan RB-engined street and drag cars on the planet – many of them for international customers. The Bayside Blue BNR34 – unofficially dubbed MGAWOT II – is arguably their greatest work yet. 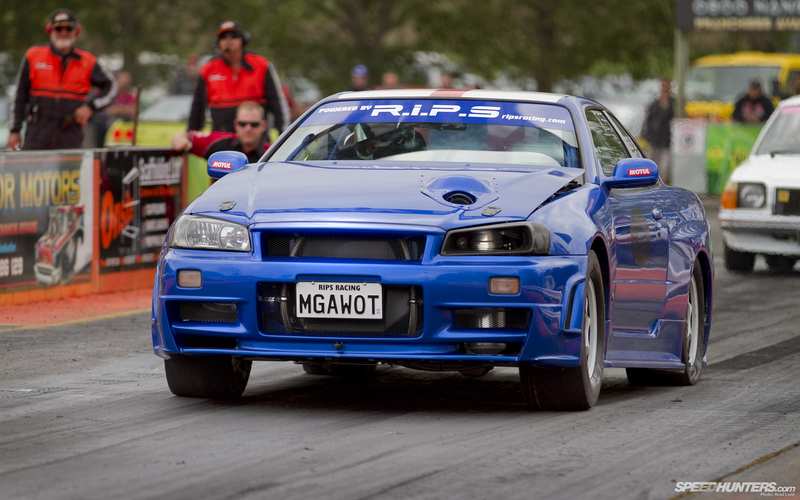 It’s certainly the most powerful Skyline to have ever emerged from the RIPS (aka Rotorua Import Pro Shop) lair. 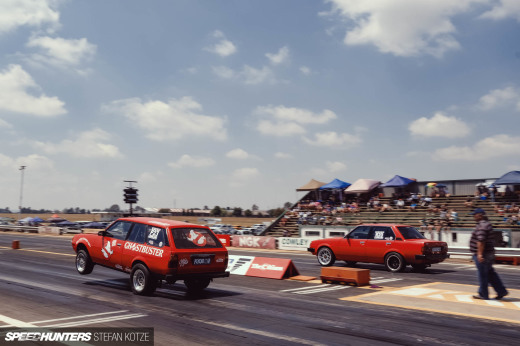 I caught wind of the Skyline-based drag project earlier in the year, not long after RIPS blew everyone away with its original MGAWOT machine – the company’s own Nissan Stagea station wagon which ran a 9.0-second pass on its very first pass down the strip and high eights ever since. MGAWOT II promised that and more, and during the course of last weekend RIPS delivered on its word in more ways than one. 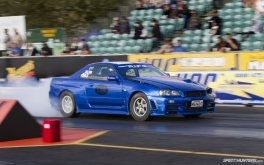 Not only did it a turn an 8.64 ET and a new NZDRA national class record on its debut run off the trailer, but it backed it up with a succession of 8.60s, then an 8.57, and finally an 8.51 at 162.5mph for the IHRA drag national class record too. For the sake of anyone wondering, MGAWOT is a play on megawatt, which in power terms equals 1000 kilowatts, or 1341 horsepower. Truth be known, MGAWOT II has a little more than that, and more impressively makes its power on off-the-pump E85 biofuel. 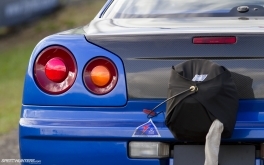 Equally remarkable, just seven short weeks ago the GT-R was nothing more than a rolling body fitted with a roll cage and a parachute. It arrived that way from the UK, but now, a couple of days after its debut racing weekend, it’s locked up in a shipping container and on its way back. 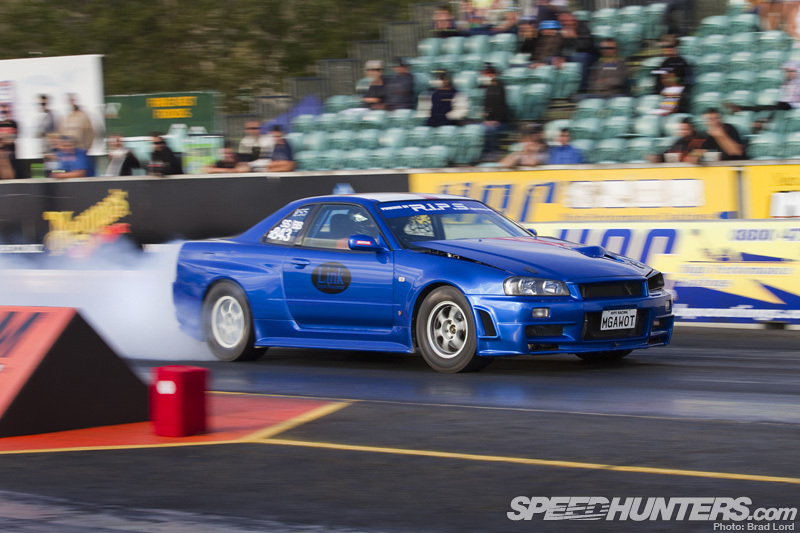 It’s not the first Skyline that’s been sent halfway around the world for Rob and his team to work their magic on and it’s unlikely to be the last. 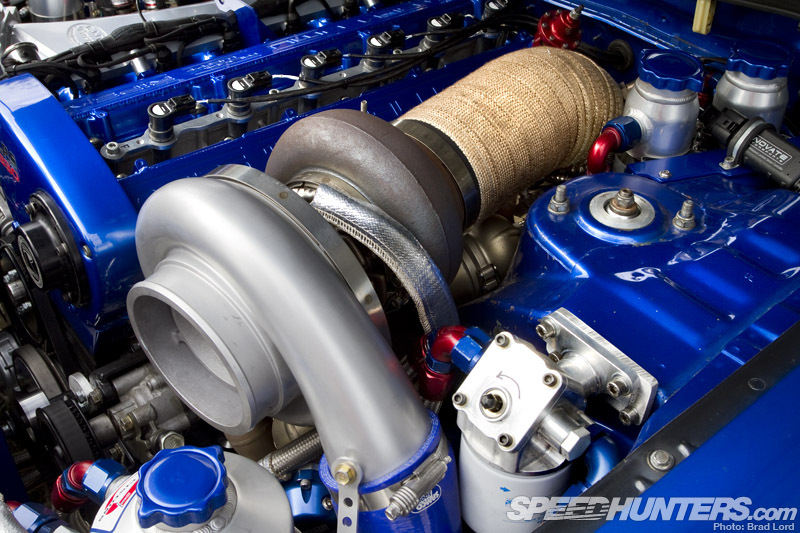 When it comes to RB engines – custom-engineered RB30s to be precise – RIPS has an enviable reputation. But it didn’t come by chance. Rob isn’t the sort of guy to ever shy away from a challenge, and he certainly doesn’t do things by halves. Too much power is seemingly never enough for this guy, and if that custom humped vent on the hood doesn’t speak volumes in that regard, lifting it up certainly will. 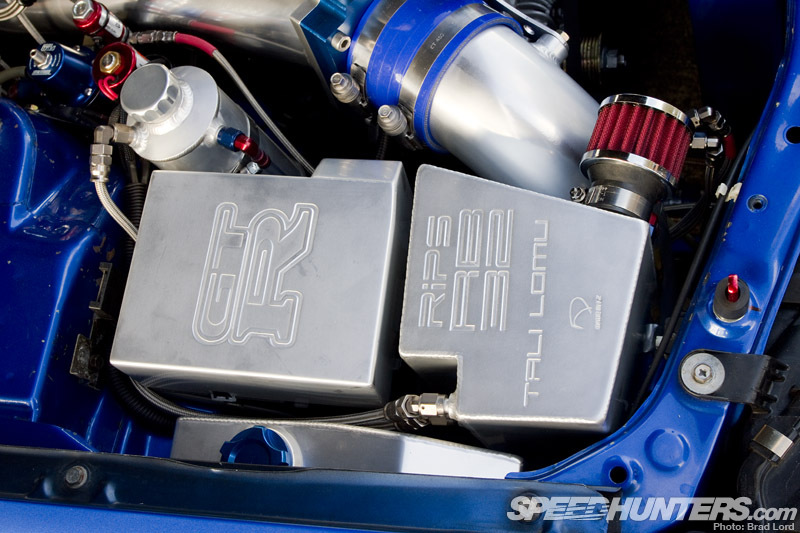 Like all of RIPS’ high-power builds, MGAWOT II’s engine is RB30 based. 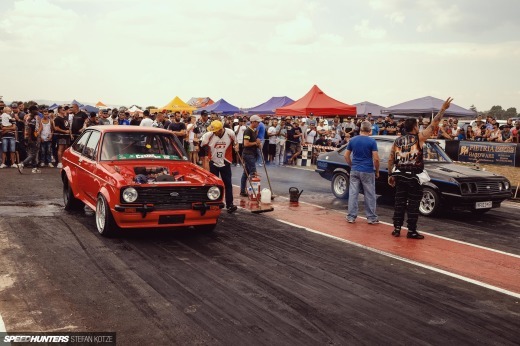 In this instance though, it’s pushed out to 3.2 litres courtesy of a Nitto Performance Engineering stroker kit featuring a 4340 billet steel crankshaft, 4340 I-beam rods, and a set of JE/Nitto forged T6 2816 alloy pistons. Not only do the upgraded internals give the engine the strength it needs to handle high horsepower loads, but they also allow to it to rev more freely, and to a 10,000rpm-plus altitude. Of course, to achieve those big numbers you need a cylinder head that’s equally up to task. RIPS’ close associate Kelford Cams got that job of delivering a race-prepped and fully-flowed head from a brand new RB26 casting. 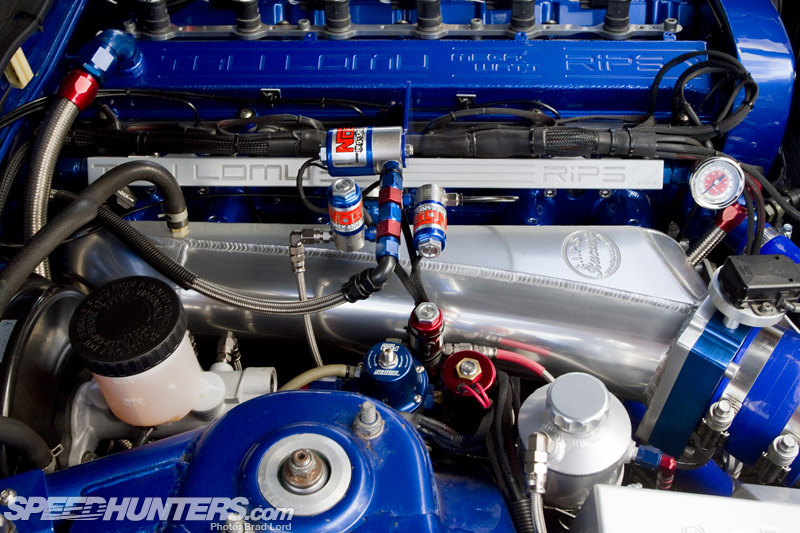 On the subject of flow just look at that beautiful hand made intake plenum that the compressed air blows through. 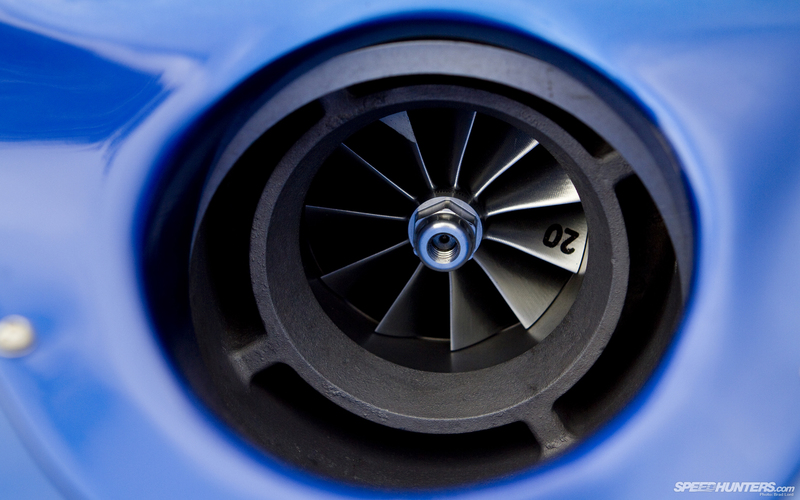 If the engine was methanol-fueled and not destined to be street driven, the package could have sufficed without the need for an intercooler, but seeing as it’s designed to run on E85 and will soon be put back on the road in the UK (yes, you read that right! ), a custom-built water/air charge-cooling system has been employed. 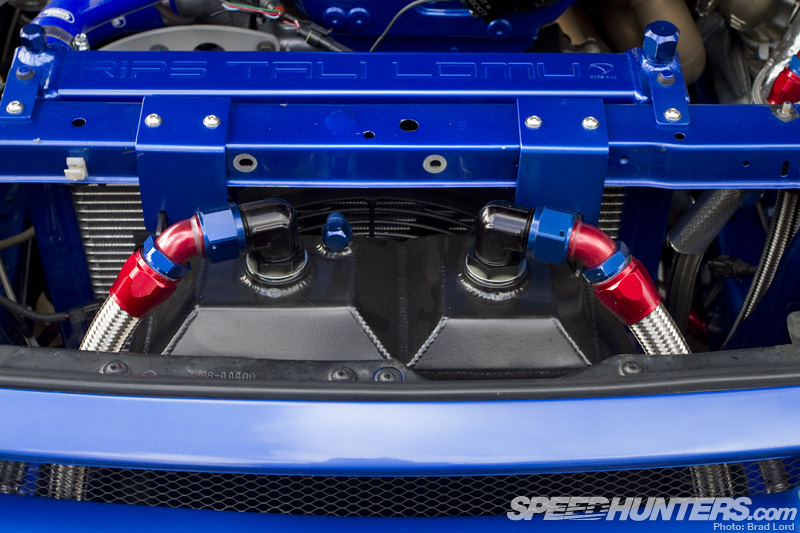 The set up pumps ice cold water stored in a custom designed and fabricated 50-litre boot mounted tank, through hoses to the ARE intercooler behind the front bumper. According to Rob it’s working perfectly to keep the intake temperature in check. The 18-litre tank on the left-hand-side hold the fuel, with a trio of Bosch Motorsport 044 pumps feeding the supply to the engine through six 2500cc injectors. That’s not the only fuel the engine feeds on, though. 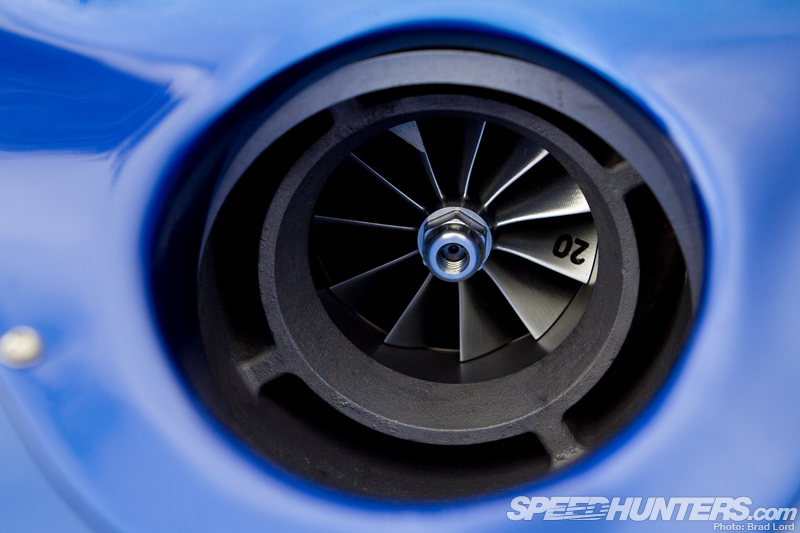 RIPS has always been a big fan of N2O, and while the Nitrous Oxides Systems set-up has the ability to deliver multi-port shots in the future, it currently only operates a small fogger nozzle for a 75hp hit that’s primarily used to bring the engine up on boost. Remember what I was saying about attention to detail? 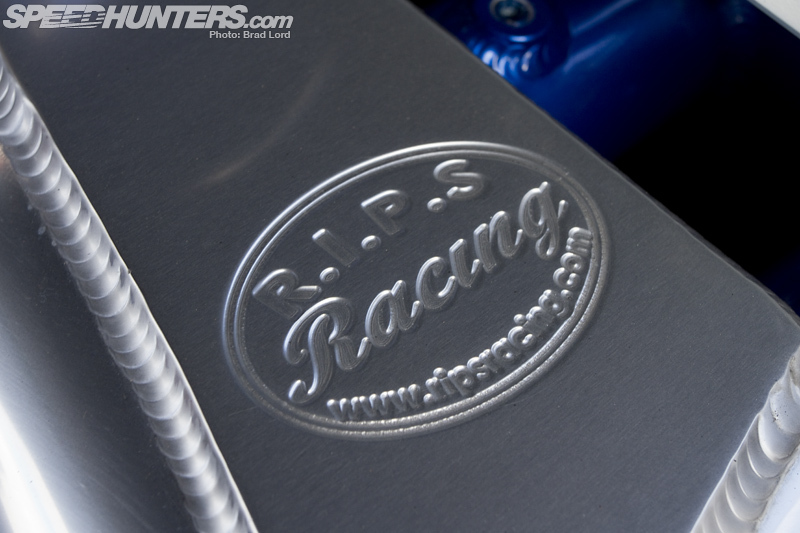 It’s evident wherever you look, right down to CNC engraving on most of the custom-made items. The Tali Lomu insignia came at the request of the car’s owner – a huge rugby supporter with an immense respect for one of the sport’s most revered players of all time. 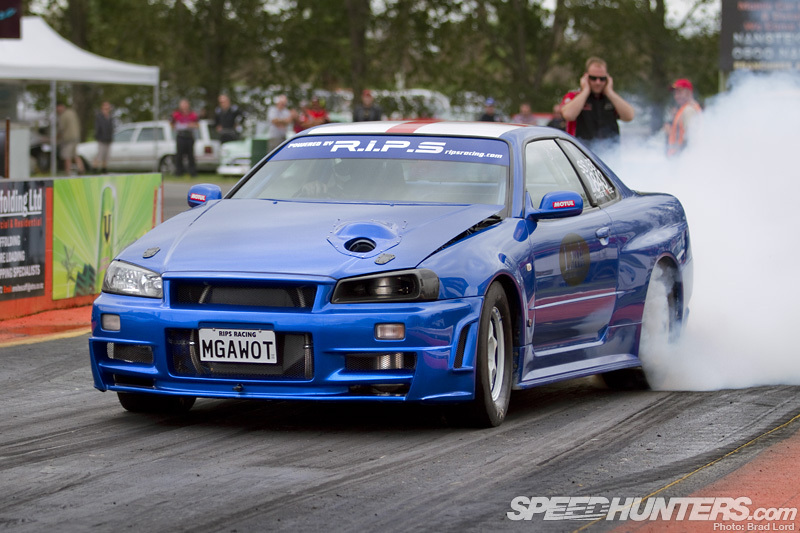 New Zealand All Black great Jonah Tali Lomu, himself the owner of a couple of fast GT-Rs, was well known for his ability to steamroll anyone who got in the way of his 6 foot 5 inch, 280lb frame, so it’s a fitting name for a car that’s been designed to mow down the competition on the 1320. 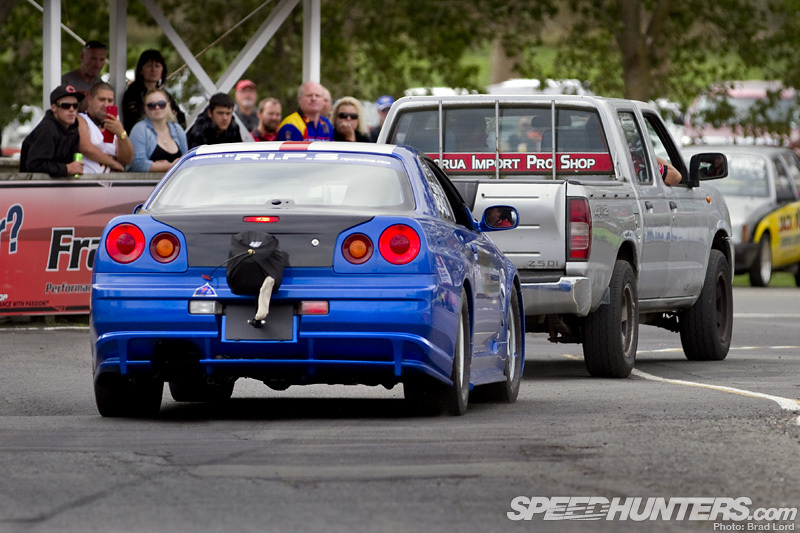 With a conservative 1500hp on offer the RB32 definitely has the credentials to get the job done, but what surprised me the most though is how civilized the overall package is. Off the trailer all it took was one twist of the key to fire the engine into life from cold start before settling at a raspy, but even idle. Maximum effect, but minimal fuss. That mantra follows through to the driveline, where alongside reliability, ease-of-use and driveability are key design traits. 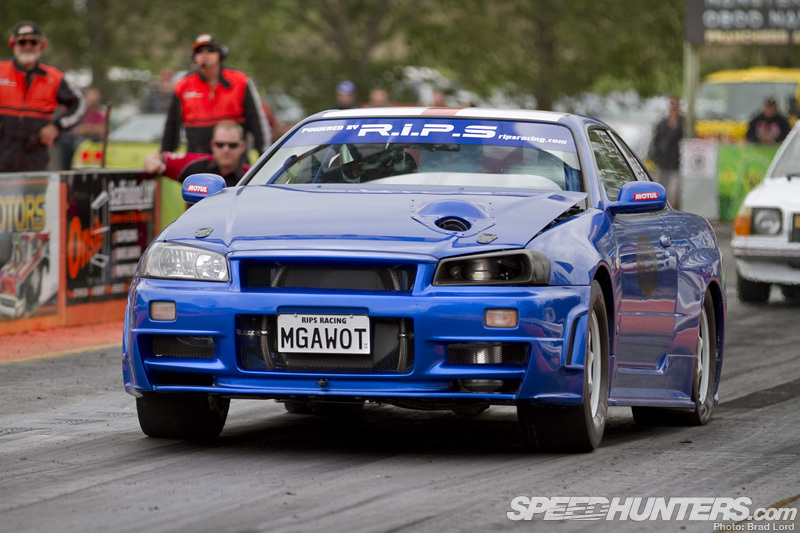 Unlike previous builds where OS Giken OS88 six-speed sequential gearboxes have traditionally been RIPS’ transmission of choice, MGAWOT II benefits from a ProMod-style two-speed, manually-shifted automatic that’s been significantly modified to integrate with the GT-R’s four-wheel drive underpinnings. The idea behind the auto transmission, which was initially developed in the Stagea, was to remove driveline ‘shock’, where immense torque loads plus a hard launch can equal expensive breakages. In a complete turnaround from the accepted norm, this GT-R catapults off the line smoothly, and even more surprisingly with just 6psi of initial boost pressure. Getting the car out of the hole and on its way to a eight-second slip is a simple proposition Rob tells me. Looking at the left side of steering wheel, the top button purges the nitrous system while the bottom one engages the transbrake. On the right-hand side the top button activates the Leash Electronics Bump Box, while the bottom button triggers the N2O. 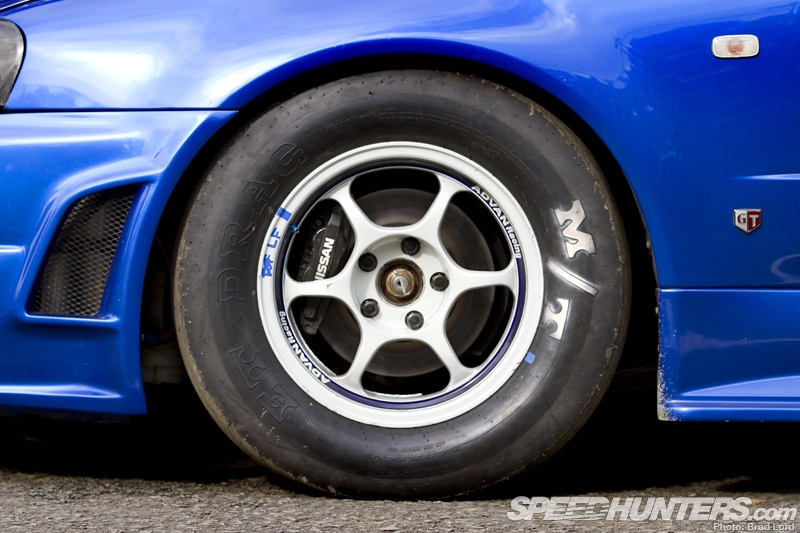 To heat the rear tyres before a run, a manual torque split controller alters the drive from full four-wheel drive to rear-wheel drive and can be adjusted to anywhere between. After the burnout, the lever with the blue button is pumped back and forth to reinstate pressure back into the system and four-wheel drive for the launch. That Bump Box I mentioned a couple of pictures back is a useful device in a set-up like this. To trigger the second set of staging lights, a driver normally has to be off the gas pedal to inch forward and fire the beam, which only leaves a split second to rebuild boost in time for the lights to drop. 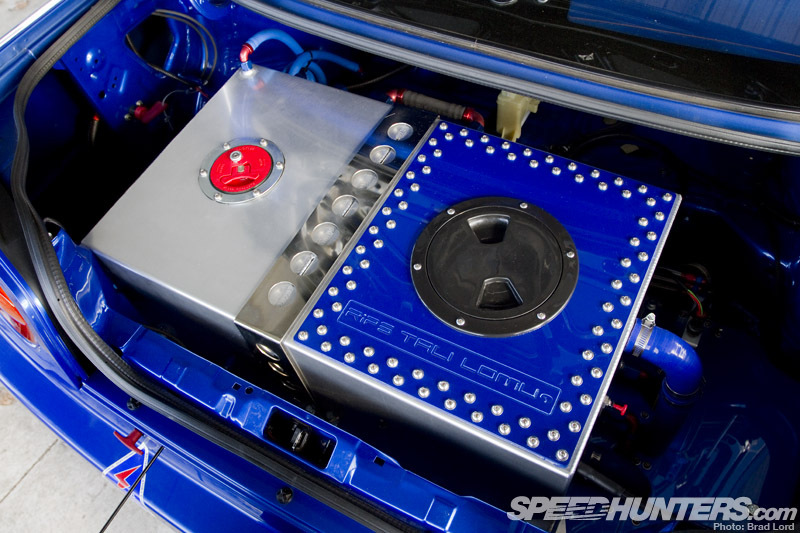 With the Bump Box, a microprocessor in conjunction with the transbrake does all the work, allowing the car to ‘bump’ into stage without the engine having to come off boost. 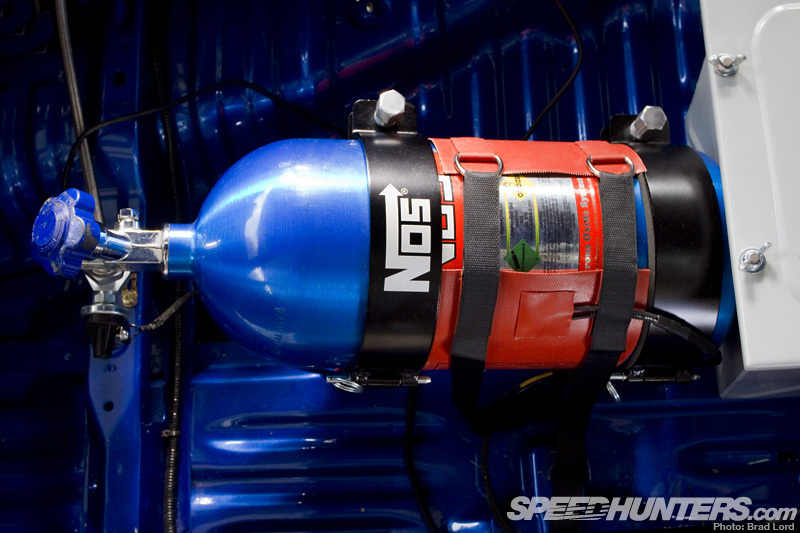 On the subject of boost, this is the first time RIPS has employed a CO2 system in one of its cars. 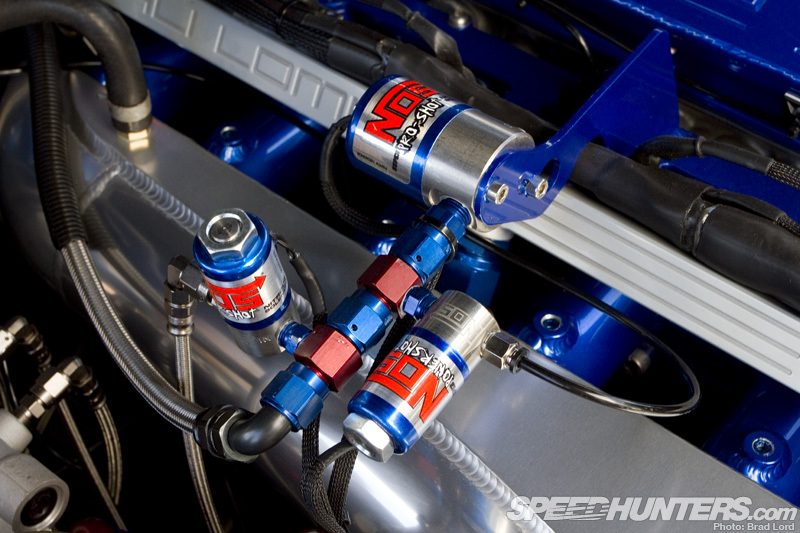 The technology, which utilizes air regulators, is perfect for this application where boost control is critical, and pressure needs to increase as the car makes it way down the strip. That said though, with its current Link G4 Xtreme engine management system tune the big RB’ is only operating at around 85 percent of its ability according to Rob. It doesn’t take a genius then to work out that this car has a lot more in it yet, and that’s before you even start thinking about removing weight, like its heavy electrics-equipped steel doors and factory dashboard from the equation. It’s also running old circuit-spec coilover suspension, and the list goes on… Seven second potential? Without a doubt. 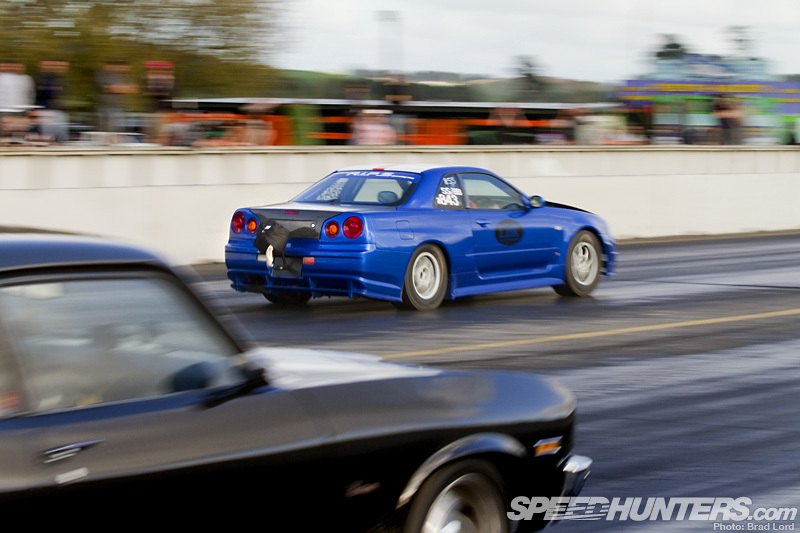 In the meantime however – if its debut performance is anything to go by – the Skyline should be at the top of the game when it hits up the Street Class of Santa Pod’s Jap Drag Racing Series, which coincidentally just kicked off for the 2013 summer season at the same time MGAWOT II was being shaken down in a far away land. mgawot shits all over nitto.